Jobs. Interested and necessary qualifications having may apply for you desired post in Than DCCB on or before 31-10-2017. Online application form will be available from 16-10-2017 for this Thane DCCB Bank Recruitment Exam 2017. There are total 205 vacancies in this Thane DCCB Bank Recruitment 2017 Notification. 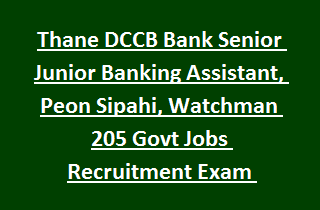 Selection for this Thane DCCB Bank Junior Banking Assistant, peon jobs and other posts is based on Marks secured in Written Test, Document Verification, Interview and final merit list. Online applications will be accepted through Thane DCCB bank official website of www.thanedistrictbank.com. More details of Thane District DCCB Bank vacancies Recruitment 2017 exam pattern, syllabus, post wise vacancies and other details are given below. There are total 205 vacancies in this Thane DCCB bank Recruitment 2017. Age limits as on 30-09-2017 for Peon/Sipahi and Watchman jobs 18-38 years. And for all other posts 21-18 years. For reserved candidates of Thane District upper age limit is 45 years. Post wise qualifications details of Thane DCCB bank vacancies are given below. General Manager- Candidate must have qualified Degree with 60% of marks. For Commerce graduates 55% of marks are enough. Must have Computer knowledge certificate of MSCIT. Banking/NBFC/Cooperative Societies experience is required. Senior Banking Assistant-Degree with 55% and for B.Com Graduates 50% marks are required along with computer knowledge certificate of MSCIT. Preference will be given candidates who are having experience in Banking sector. Written exam will be conducted for all the posts for 90 marks. Minimum qualifying marks are 45. Exam paper will be objective type only. Exam will be held in Marathi and English languages. Interested and qualified personal may submit your application form online on or before 31-10-2017 through Thane District Central Cooperative Bank Official website or www.thanedistrictbank.com.